Below is a video clip of the great fashion magazine editor Diana Vreeland. This is such a treat, and the only video clip I can find of her. "Too brief a treat," Truman Capote would have said. Vreeland, who was the fashion editor at Harper's Bazaar and then the editor in chief at Vogue for many years, was an artist and her medium was magazines. She had a brilliant way with pictures and words that was inspiring and magical. She pushed the reader to use the imagination and create something new and different, to be original. She herself was not a beauty, but she transformed herself into a legendary figure that shaped the world of fashion. Her own self-discipline had a lot to do with it. 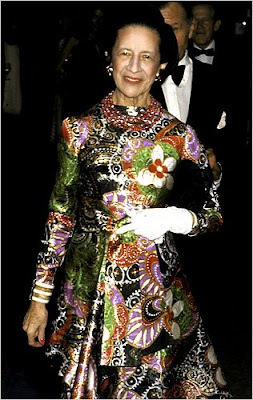 After she was fired, Vreeland went on famously to expand The Metropolitan Museum of Art's Costume Institute and put it on the map with her blockbuster shows. I interviewed her once on the phone for an article I wrote for Vogue about how costume exhibitions influence fashion designers. After we were done talking, Vreeland said to me, "Thank you for calling me." When Vreeland died in 1989 I was invited to the memorial service at the Met. Jacqueline Kennedy Onassis was a guest, and George Plimpton and Richard Avedon spoke. A few years ago I profiled the great fashion editor Polly Mellen for the Bergdorf Goodman magazine. Diana Vreeland hired Polly Mellen, first at Harper's Bazaar, and then brought Polly over to Vogue. Polly said to me, "I was in love, no question, with Mrs. Vreeland." Click on the image below to enlarge it and read my article here. In the clip below, Vreeland is being interviewed by Mike Douglas. I fondly remember Mike Douglas's talk show, but he looks out of his element here, asking questions like, "What is style and who has it?" and "Do you favor tailored clothing or an experimental look?" Vreeland is promoting her upcoming shows at the Met which she describes as "a big potpourri, rather like a souk, rather like a marketplace, rather like an arcade." She gets out some good lines including, "Style takes inspiration and imagination," and "Education has a great deal to do with everything." She talks fondly about the 1920's -- "The dancing, the music, the arts. The world was alive with everything new. It was the start of the twentieth century." "The Roaring Twenties!" exclaims Mike Douglas. But undoubtedly, Vreeland is not talking about the American Roaring Twenties, she is talking about Paris in the Twenties, and Picasso and the Ballets Russes and Stravinsky and Chanel. "In Europe, I think there is more snap in the air," Vreeland purrs. "Yes I do." Television wasn't her medium but on this occasion Mrs Vreeland looked wonderful and her responses were crisp and direct. The House of Beauty and Culture and click on. She was, and always will be, an inspiring personality, the likes of which are sadly extinct. Hi Toby, thanks for your comment, I have seen that video. DV is much more relaxed and "at home," it is fun to watch.